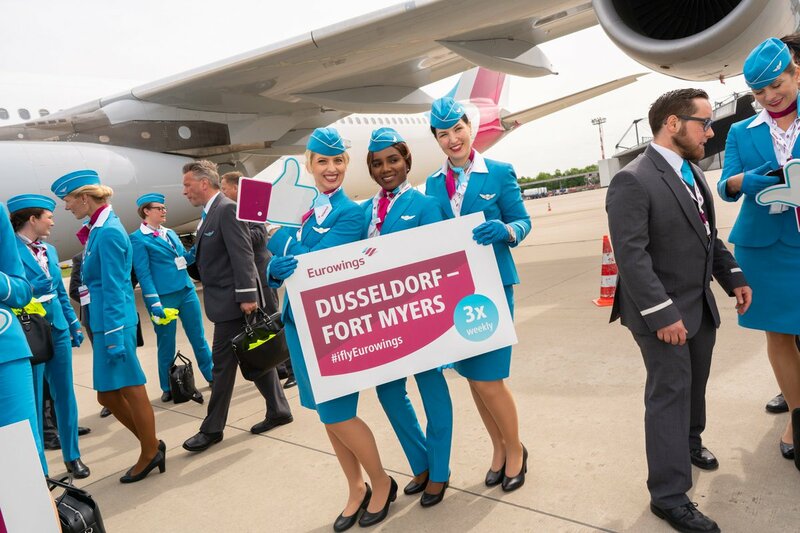 Travel to the Sunshine State with Eurowings: today (Thursday, 3 May 2018), Eurowings launched another direct flight from Düsseldorf to Fort Myers in the USA. Passengers will fly to the southeast of the United States three times a week (Tuesday, Thursday and Saturday) and can also combine their flights to or from Düsseldorf with a connection via Munich to optimise their travel plans. The airline is thus supplementing its long-haul range from the capital of North Rhine-Westphalia’s airport and expanding its market leadership there: Europe’s fastest growing airline now has 40 aircraft based in Düsseldorf, offering the most extensive route network among all its locations. The route to Florida will be operated with a Brussels Airlines Airbus A330-330. Among other things, it offers a BIZclass for the most demanding passengers – a fully-fledged business class with full flat seats that convert into beds with a flat reclining surface. Eurowings is the only low-cost airline with such a high-quality offering. Eurowings flies the route between North Rhine-Westphalia and the Sunshine State, with its perfect average temperature of 25 degrees even in winter, in just over ten hours. The Airbus A330 manages the return flight in just under nine hours. To introduce the Eurowings BIZclass, which can be booked at unrivalled special rates starting from EUR 799.99, customers of the Eurowings Boomerang Club or Lufthansa’s Miles & More will receive double reward miles. The special offer is already live. It applies to bookings up to 31 May and to journeys between 1 May and 31 July 2018. In addition to the rapidly growing offering of short and medium-haul routes, the market leader at Düsseldorf airport will be able to offer 1,700 more long-haul flights per year from here and thus carry around 450,000 additional passengers. The Eurowings Group’s long-haul fleet in Düsseldorf is expected to expand to seven jets by the winter flight schedule 2017/18. Eurowings currently operates 40 aircraft at Düsseldorf airport, which fly more than 1,750 times a week to 95 destinations in Germany, Europe and around the world.